Mini Raspberry And Chocolate Nests. These are fun to make and decorate with small helpers. Perfect for a real tea time treat they can also be made into individual birthday cakes with the simple addition of a candle in the centre of each one. Preheat the oven to 180oC, 350oF, gas mark 4. Lightly brush the insides of a 12 section deep muffin tin with a little oil and line the base of each one with a circle of greaseproof or non-stick baking paper. Put the margarine, sugar, flour and baking powder into a mixing bowl, add the cocoa paste and the eggs and beat until smooth. Divide the mixture evenly between the sections of the muffin tin, smooth the tops level then bake for 12-15 minutes until well risen and the tops spring back when lightly pressed with a fingertip. Whip the cream in the rinsed and dried mixing bowl until it forms soft swirls. Split the cakes in half then sandwich back together with cream, spreading the remainder on top. 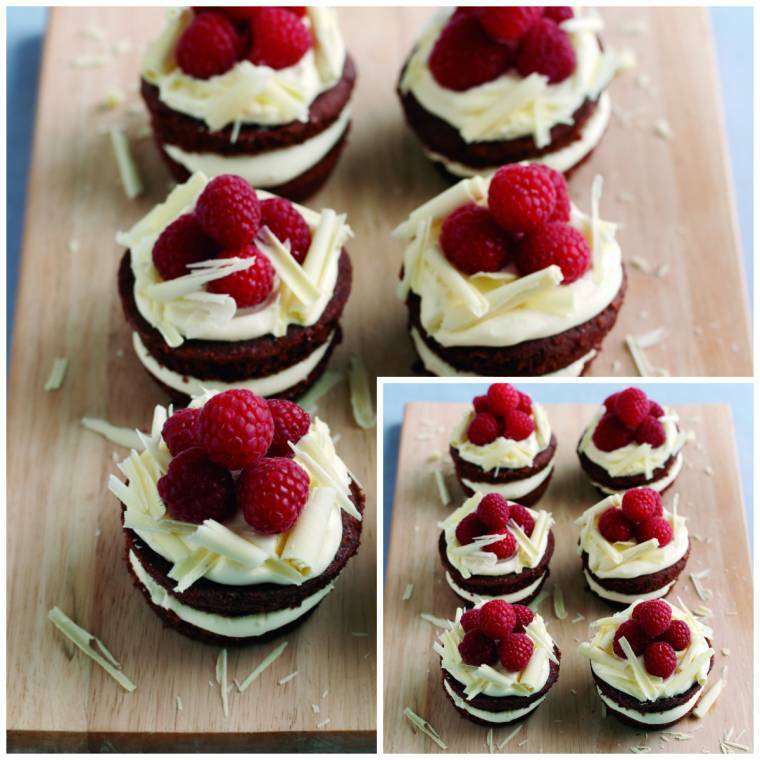 Arrange the raspberries in the centre of each cake then sprinkle the chocolate curls around the edge to make a nest. Arrange on a plate to serve. To make chocolate curls, unwrap a block of white chocolate and turn over so the underside is uppermost on a chopping board. Run a swivel bladed vegetable peeler along the edge to make curls. If the curls are very tiny, put the chocolate on a plate and microwave on full power for 10 seconds to soften the chocolate then try again. If it is still difficult microwave once more and then try. About this post -This is a guest post. No payment was received. Recipe and photo credit by Seasonal Berries. 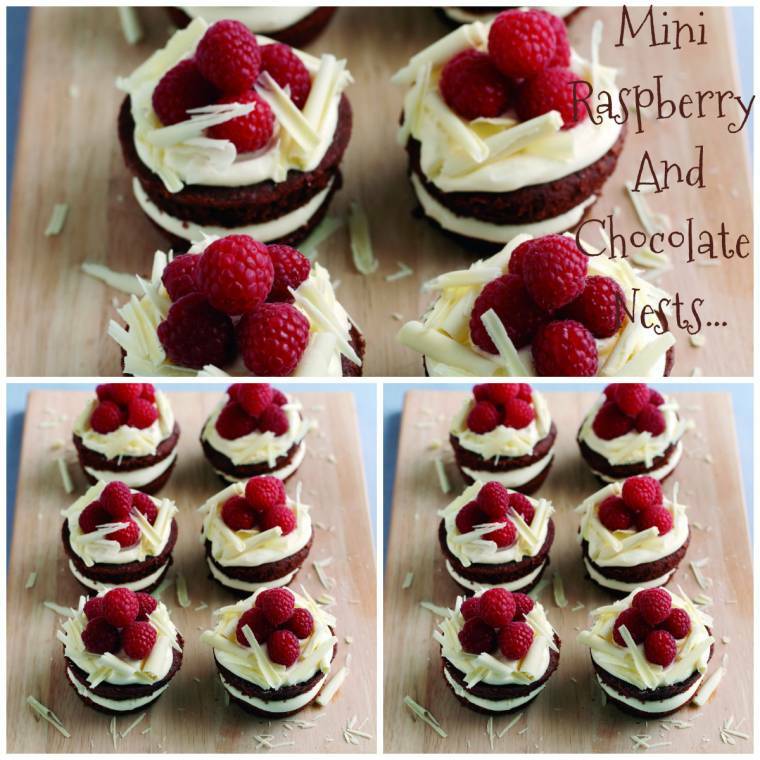 What do you think of these Mini Raspberry And Chocolate Nests? "Wednesday Blog Hop : Wishing Well…"